This summer's (sic) first camping meet was to Once Brewed, by Hadrian's Wall. Despite the lack of anything particularly summery, a great time was had by all. On Saturday, Peter, Mike, Alan and Donal went off to Kielder for some mountain biking, where Peter was eaten by midges. 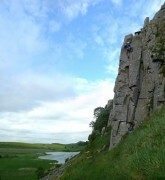 Carmen and I met up with Jamie at Crag Lough, under the Wall, to take advantage of the dry conditions for some climbing. Any midge that had shown its head would have been immediately blown into the North Sea, so we stayed uneaten. We managed half a dozen routes, from VDiff to MVS, though as is often the case here, the guidebook grades bore only a passing resemblance to their actual difficulty. 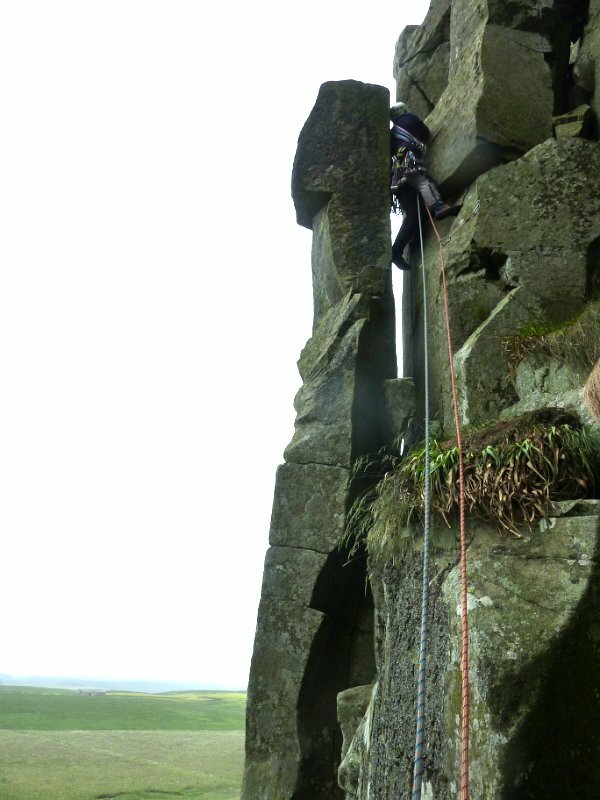 Jamie led the classic hard severes of Main Wall and Hadrian's Buttress. I led Dexterity (S) and Hadrian's East (VD). And Carmen led Ash Tree Wall (S) and the main sandbag of the day, Grad's Groove. 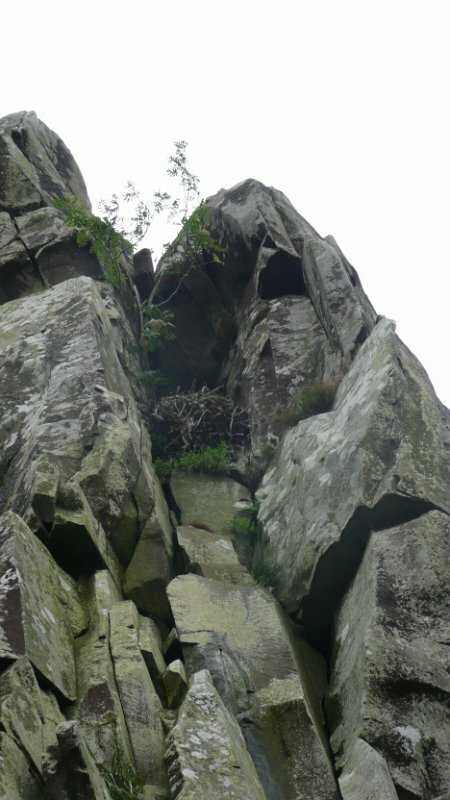 Graded MVS 4b, but with 5a moves to leave the ground, the crux for Carmen was climbing into and then out of the massive nest that blocks the upper chimney. Sunday brought more of the same weather. Mike headed off for some more biking. Alan did a long run along and around Hadrian's Wall. Donal and Peter finally managed to climb at Crag Lough, after many years of rainy visits, but called it a day after being sandbagged on two "VDiff"s Bracket, and Tarzan's Mate – climbing at this crag takes some getting used to! Carmen and I started out at Peel Crag, where I led Tiger's Chimney (VD) prior to Carmen's attempt on Tiger's Overhang (VS 4c, with the crux involving getting over a large horizontal roof). Discretion won the day and she retreated into the chimney, to return sometime in the future, packing extra bottle. We then returned to Crag Lough, where I led Face Route (S, but easier than most of the VDiffs) and Carmen did Sinister Groove (S, but would be VS anywhere else). Some light rain put an end to anything hard, so we finished with Trapezium (Diff), Back Alley (Diff), and Route Two (VDiff). You are currently browsing the York Alpine Club Blog blog archives for July, 2013.